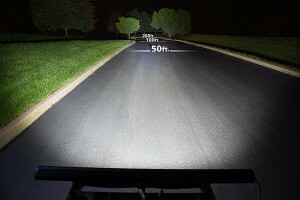 When seeking the best visibility for your daily drive, off-road vehicle or ATV, it pays to educate yourself on the latest LED technology, products and options. This comprehensive guide compares LEDs to other popular lighting technologies, tells you how they work and covers LED light bar applications. You will learn how to compare quality LED light bars from cheaply made ones. Several informative LED light bar reviews are included also. After reading our ultimate guide, you’ll be able to make an informed purchase decision that matches your application and provides the best bang for your buck. 2 What is a LED Light Bar and Why Do You Need One? 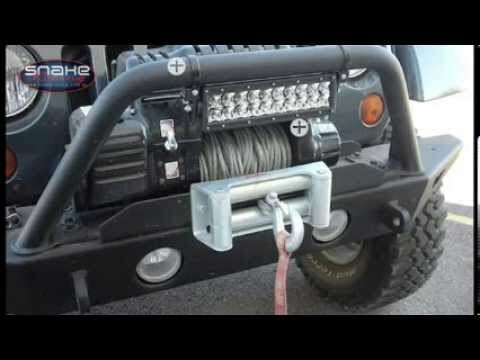 5 What Is a Cree LED Light Bar? 6 Flood, Spot or Combo – Which LED Light Bar Do I Need? 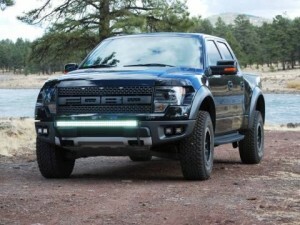 9 LED Light Bar Brands – Who Makes the Best LED Light Bars? 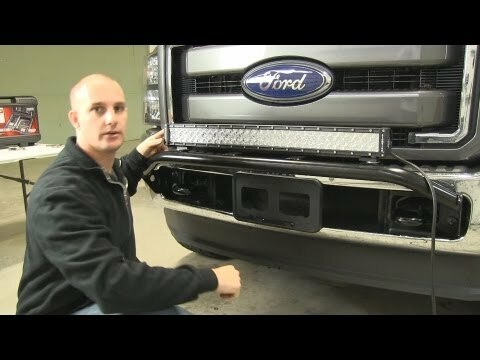 What is a LED Light Bar and Why Do You Need One? A light bar is a short or long array of high-luminosity LED lights. These supplement your vehicle’s stock headlamps. They provide a brighter, broader and penetrating beam of light ahead, behind or to the side. 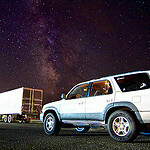 They provide a significant advantage for night driving or when illuminating trails, campsites or work areas. Night Driving – Light bars can produce a dramatic difference in road visibility over the brightest stock headlights. By the way, you can check LED headlights for Jeep Wrangler. Those are not so powerful as light bars, but better than stock headlights! Heavy equipment – Snow plows, graders and tractors find light bars essential in poorly lighted conditions. Tungsten-Vacuum Lights – A tungsten wire filament within a vacuum is heated by electricity causing the wire to emit light. Halogen Lights – A high-performance version of Tungsten-Vacuum lamps with a tungsten filament enclosed in halogen or iodine gas. 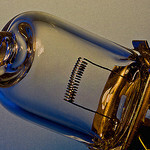 HPS Lamps – High-Pressure and Low-Pressure Sodium lamps pass an electric arc through a gas mixture containing mostly sodium. HID Lamps – High Intensity Discharge lamps pass an electric arc through gas mixtures that also contain metal salts to form a high intensity plasma. 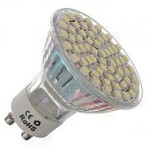 LED Lamps – Light-Emitting Diodes are solid state devices that emit light when electrons pass to electron holes. Manufacturers double their efficiency about every 3 years. Ordinary vacuum filament lamps were standard for cars from the 1930s until the 1990s, until more efficient lamps were developed. They are still used in directional signals and license plate lamps. High-Intensity Discharge lamps improve on halogen lamps both in efficiency and life. Adjusting the mix of gas and salts produces different color temperatures. Since all the mixtures contain xenon gas, they are often referred to as xenon lamps. The xenon gas eliminates start-up flicker. LEDs became practical for road illumination relatively recently but are now a highly efficient automotive lighting option. Modern cars use them extensively for road lights, direction signals and interior lighting. The efficiency of a particular lamp technology is measured in lumens per watt, which tells you how much light you get for a given amount of electricity. Color temperature specifies where in the human visible light spectrum the light falls. A lower number indicates a warmer, yellowish light, whereas higher temperature produces a whiter or bluish light. Color render refers to the ability of a lamp to recreate natural colors at night. As the table above demonstrates, LEDs, despite higher initial cost, are most cost-effective over their lifetime. They compare well in efficiency with HID lights and, depending on the color temperature chosen, can create nearly perfect rendering of colors. 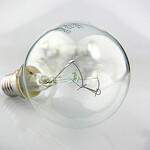 For better understanding, see some comparisons of light bulbs in household. Instead of depending on a single bulb, a headlight or light bar consists of separate high-intensity lamps, which increases reliability. LEDs do not require a ballast or voltage conversion, since they run well at the normal 13.8 volts of most automotive systems. You can run them from portable generators too. They project their heat rearward, so the lenses are cool to the touch. LED headlamps and light bars, unlike filament lamps, stand up well to vibration and shocks. 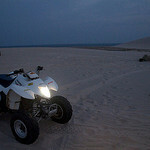 Two short ATV light bars front and back improve your vehicle’s visibility during darkness or daytime, especially on sunken trails or in dunes. It gives you excellent output when it comes to brightness and light-weight intensity. 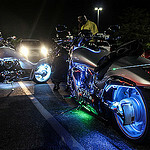 You can augment these with red strobe LED light bars mounted high on your equipment. ATV LED light bars draw so little current that you can leave them on when trailering for extra safety. Whenever you need to see your surroundings or be seen, one or more LED light bars makes a big difference. A pair of auxiliary LED amber lamps mounted low will penetrate fog, drizzle and the gloom ahead. An LED light bar in your trunk, under the engine hood or the car interior lights up every nook and cranny. An LED brake light bar increases reliability over standard brake lights. Motorcycles and golf carts become safely conspicuous with the addition of strategically placed red, blue or amber LED light bars. High luminosity and low power consumption make LED emergency lights essential for fire trucks, ambulances, police cars and other public service vehicles. Emergency LED lights fit in vehicle grills, sun visors, mirrors or on the roof. Choose white, yellow, red, blue or a mix to maximize visibility. Their millisecond on-off cycle time makes them ideal for flashing or strobe applications that alert drivers and pedestrians. 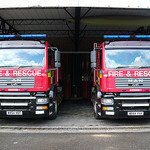 Bright white LED light bars will flood incident areas with light. A long, curved LED light bar producing 24,000 effective lumens will consume less than 300 watts and draw 22 amps, which is less than most headlight systems. It can flood a large work site with bright light. High quality marine LED light bars are waterproof and come in a variety of colors. They make excellent navigation lights. 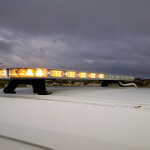 White or amber light bars will light up landing sites or dock approaches. Small light bars are great for illuminating controls, hatches or an engine compartment. Their input voltage range is a good match for most marine electrical systems. LED strobe lights can be white, red, amber, blue or green, any of which can draw attention to potential hazards. Light flashes can be regular or irregular to alert workers to out-of-spec operating conditions. Rotating beacons are simulated by electronic sequential switching. Their low power consumption is suited for portable traffic control and construction warning signs. LED light bars can bathe an outdoor patio or a garage in bright light. Smaller light bars can illuminate workbenches, crawlspaces or attics. Thanks to a greater ability to focus and direct light, we find that the LED light bar create better visibility for the owner. They run from a 12 volt battery or a portable generator, so make reliable backup lighting during power outages. Portable, mini light bars can plug directly into an automotive 12VDC outlet for hazard or interior lighting. They work well for under-cabinet lighting or to brighten a dark closet. They are often used for outdoor lighting accents around ponds or landscaping. These can be supplied with power from a small solar panel and sealed lead-acid batteries. LED light bars may contain one LED or dozens. The LEDs within a single bar are usually the same size but power sizes and colors can be mixed. 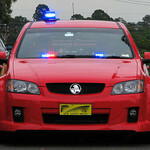 For example, a police vehicle light bar may contain white, amber, red and blue LEDs of various strengths. Some or all of these may flash. The smallest light bars are often referred to as light pods. They are used as side lights, work lights or portable spotlights. Cubes of 4 LEDs are regularly used as fog lamps. These are rectangular, enclosed arrays of up to 96 LEDs in a single bar. The LEDs may be arranged in single, double or quad rows. 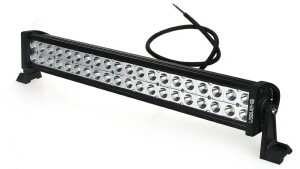 These light bars contain a single row of LEDs and are usually under 20 inches long. Their low profile makes them ideal for vehicle grill mounting. The range of colors available for LEDs runs from deep red to hot blue. There are even LEDs that emit UV and IR light, which often find application at your dentist’s office or for trail cams, respectively. What Is a Cree LED Light Bar? In your search for the best LED light bar, you will come across the term Cree light bar. Cree refers to the LEDs in the light bar, not to the brand of light bar. All the light bars in this guide’s LED light bar reviews use a version of Cree LEDs. Cree, Inc., located in North Carolina, manufactures these powerful, highly efficient LEDs. They are the highest quality, longest lasting, and most efficient LED lighting for homes, businesses and roadways. The finest Cree LED light bars have an efficiency at the top end of the scale for LEDs approaching 120 raw lm/W. With proper current control, they have a lifespan over 50,000 hours. Unlike cheaply made LEDs, Cree LEDs do not fade early. Despite higher initial cost compared to other LEDs, in the long run they cost less to operate. As an example, a popular light bar choice is a 20″ Cree LED light bar that contains 40 3-WCree LEDs. This runs at 120 watts and produces 9600 effective lumens. Flood, Spot or Combo – Which LED Light Bar Do I Need? Unlike standard screw-in home bulbs, which throw light out in all directions, LED light bars concentrate their light in one direction. The way the light beam is formed depends on each LED’s reflector and the shape of the lens. Modern light bars use computer-aided designs to achieve specific lighting patterns. The lighting pattern trade-off for light bars is between distance and beam width. For the same luminosity, more distance requires less beam width and vice versa. When a design favors a wider beam width, you have a flood light. More distance is achieved by narrowing the light beam into a spot pattern. A flood LED light bar typically has between 40 and 120 degrees of beam width. Spots are around 10 to 30 degrees. 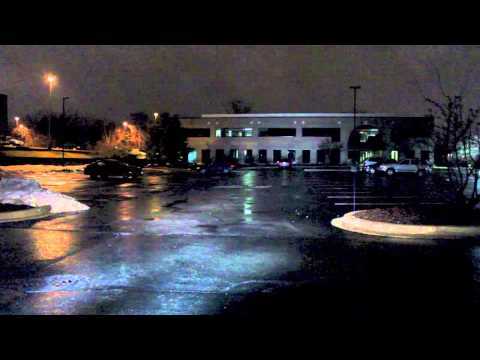 Keep in mind that flood and spot degrees vary between different models of led light bars. So which one is best? It depends on the application. Both are useful and a common choice is to buy one of each or purchase a combo bar that has spot and flood functions combined. A combo works by assigning the jobs of the spot and the flood light to different sections of the light bar. It can do this by dividing flood and spot reflectors along the bar’s length or by splitting the functions between rows. The best LED light bar of one manufacturer allows you to custom design your flood to spot ratio with swappable reflectors. Enclosed LED light bars typically come in the following lengths: 4 inch led light pod, 6 inch led light bar, 10 inch led light bar, 20 inch led light bar, 24 inch led light bar, 30 inch led light bar, 36 inch led light bar, 40 inch led light bar, 50 inch led light bar. Light bars can be round, rectangular or square. Round ones are able to fit more LEDs in a smaller area and may complement your vehicle’s design better than square lights. As discussed previously, the beam angle dictates the width and depth of the area of illumination. For driving, deeper penetration is usually better and to light up work sites a wide angle works well. Lumens per watt, or lm/W, measures the efficiency of a single LED or an entire LED light bar. This is a good, though not perfect, indicator as to the quality of the LEDs in the light bar. Higher efficiency LEDs have a longer life and resist fading. Manufacturers can fudge this number by measuring lumens at a voltage lower than the normal 13.8 VDC found in most vehicles. Correlated Color Temperature, or CCT, specifies where a lamp’s output falls in the visible light spectrum. The unit of measurement is on the Kelvin temperature scale. Thus, a particular lamp’s temperature is a number followed by a K, such as 5000K. Cooler light temperatures are at the red end of the spectrum but are perceived by humans as “warm,” whereas higher temperatures are seen as “cool.” LEDs can produce light all over this scale, from about 1000K to 9000K, but only a small range is useful for an LED light bar. Manufacturers have adopted an IEC standard known as the IP Code, where IP stands for Ingress Protection. Good LED light bars carry an IP rating to indicate resistance to dust and water entering the light. All you need to be concerned with regarding IP ratings are two numbers. The first, on a scale of 0 to 6, indicates the light bar’s resistance to dust penetration and the second number indicates resistance to water intrusion on a scale of 0 to 8, plus a special 9K rating. You see these numbers preceded by “IP.” For example, a light bar may have a rating of IP67, meaning it is completely sealed against dust and can stand immersion in one meter of water for 30 minutes. Two types of waterproof connectors are used on quality LED light bars, which are referred to as ATP or DT connectors. Both types are made from thermoplastic and have IP ratings of IP67 or above. They operate within a wide temperature range and use corrosion resistant contacts and silicone seals. They accommodate several wire sizes. Most, not all, LED light bars are made to run within the 13.8 DC voltage supplied by most cars or trucks without modification to the light bar or your vehicle’s electrical system. For instance, it is common to see “9–30 VDC” or “10-70 VDC” as the bar’s input voltage range. These mean that you can operate the LEDs in a 12V, 24V or 48V system as long as that voltage falls within the specified range for the light bar. Do not get the idea that if you apply more voltage that the LEDs should give off more light. The amount of light an LED gives off is determined by current, not voltage. The current at each LED is maintained within a narrow range by a device known as an LED Driver. Without an LED driver, your light bar’s color temperature and brightness would vary considerably. 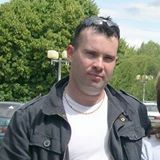 Sometimes, you see in LED light bar reviews owners who apply higher voltage to brighten their lights. Unfortunately, this is an indication that cheap LED drivers were used and this will shorten light bar lifespan. The most sophisticated LED light bars have LED drivers that use Pulse Width Modulation to control LED current. There are also available external PWM units that effectively do the same thing for LED light bars without built-in PWM. LEDs do not overheat even at 100 percent capacity. With an external control, you can dim or strobe the light bar. It adds protection against voltage spikes from vehicle electrical systems. 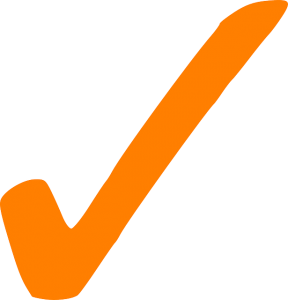 Warranty – Warranty length and terms help you gauge the confidence a manufacturer has in their product. LED Arrangement – LEDs may be arranged with a single, double or quad row pattern. Multi-row bars often have both spot and flood function. Wiring Harness – The best LED light bar comes with a wiring harness that includes cables, fuse holder, one or more switches and a relay. Multiple Circuits – Some light bars separately switch banks of LEDs for spot or flood. They may include amber, red or blue LEDs on a separate circuit. Color Lenses – Snap-on colored lenses change the light bar’s color. Multi-position Brackets – Some light bars come with optional brackets or a system of brackets that clamp to channels on the light bar housing. The number one enemy of LEDs is heat. A quality light bar will have oversize heat sinks and tight current control. If possible, check the operation of a light bar you are considering under different voltage inputs. If the LEDs brighten noticeably as voltage rises, this is a sign of poor LED drivers. Look closely at mounting points and brackets. The best LED light bar has sturdy, corrosion-proof mounting hardware and provide options for mounting the bar in different locations. Check the IP rating. At a minimum, it must be IP65. IP69K is the highest rating, but few light bars achieve that. Make sure the electrical connectors are IP-rated. A wide product line from 3″ light pods up to 50″ bars and plenty of accessories are signs of a quality light bar manufacturer. Most importantly, check the warranty. Top LED light bar makers back their products with lifetime or near-lifetime guarantees. Be sure to check the fine print for exclusions. How to tell a cheap LED Light Bar from a good one! LED Light Bar Brands – Who Makes the Best LED Light Bars? Black Oak’s high standards in build and performance come at prices half what competitors charge for equivalent products. Single-Row – Black Oak’s S-Series features a stealth 2-inch profile and powerful 5W OSRAM LEDs. There are six S-Series lengths from 6 to 50 inches with one LED per inch. Raw lumens output is from 3,300L to solar-bright 27,500L and power from 20W to 250W. Double-Row D-Series – Black Oak’s most popular line, the D-Series features two stacked rows of ultra-bright 5W OSRAM LEDs in a 3.3-inch housing. Seven sizes range from four inches up to 50 inches with luminosities of 4,400L to a blazing 55,000L and power ratings from 40W to 500W. Curved and Marine-grade D-Series light bars are available also. Pods – Black Oak’s compact LED pod lights are four LEDs in a 2×2 pattern encased in a rugged, IP69K, swivel-mount, 3.25×3.23-inch housing. Buyers have a choice of either 5W OSRAM LEDs or super-bright 10W CREE XM-L2 LEDs. Two beam optics are available: High Throw Spot or Wide Flood Optics. Rounds – Available in 7-inch and 5-inch diameters, Black Oak’s Round LED Light Bars blend spot and flood optics for the ideal blend of long throw and wide coverage. The larger and smaller round light bars feature 32 or 21 OSRAM LEDs, respectively. 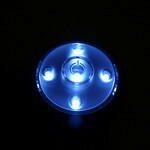 Buyers can choose either 3W or 5W LEDs. Luminosities with 5W LEDs are 17,600L and 11,550L for the larger and smaller rounds, respectively. Every Black Oak lighting product comes with a turnkey, IP69K wiring harness that includes cable, relay, fuse and switch. No other maker of LED light bars makes a better product at the value prices that Black Oak offers. Most products receive a further 15 percent discount for military, police and fire organizations. 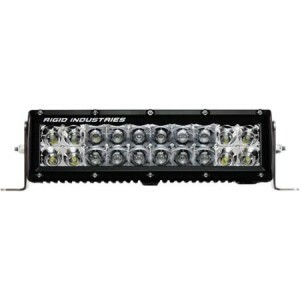 Rigid Industries began producing LED light bars in 2006 and have since become an industry leader with top-rated lighting products made in the USA at their Arizona plant. Their lights are well-rated among off-road enthusiasts. With their acquisition by Penske, they have entered the heavy-duty equipment and commercial vehicle market segments as well. Rigid produces 13 product lines including courtesy lights, scene lighting products and vehicle light bars. E-Series – This is Rigid’s original LED light bar designed to project long-distance beams. 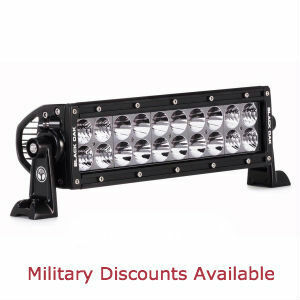 Included in this category are their E2 and M-Series marine LED light bars in lengths from four inches to 50 inches. E-Series lights come in spot, flood or combo patterns, whereas E2 lights utilize Hyperspot and Specter lighting configurations. D-Series – These are versatile 2×2 or 2×3 LED light pods with a variety of mounting options. The D2-Wide pod with amber LEDs makes an excellent fog light. Dually X-Series – Duallys are the successors of the D-Series with more and brighter LEDs. 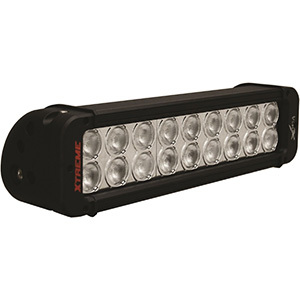 The Dually XL Flood features a 3×3 LED array that outputs 2,736 raw lumens of driving light. Xmitter Prime LED Light Bar – This is a dual-row light bar using 3W LEDs housed in an extruded 6061 aluminum housing with shatterproof polycarbonate lens. It comes in lengths of five inches to 43 inches and features bottom stud mounts. 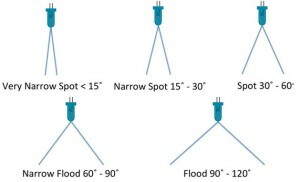 Beam options are 10-degree Spot or 40-degree Flood. Evo Prime Single Stack LED Bar – In lengths from five inches to 51 inches, Vision X’s new Evo light bars feature a single-row of night-crushing, top-bin 10W LEDs, each of which output 1,079 raw lumens of 6000K light. 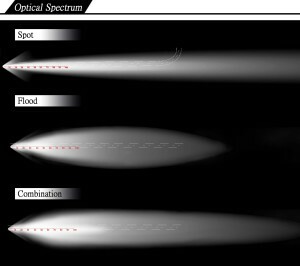 Available beam patterns are 20-degree Spot or 40-degree Flood. Vision X also sells a single 90W LED round Cannon light that projects a focused beam over 3,000 feet forward. Based in San Marcos, CA, Baja Designs has made a name for itself as the “scientists of lighting.” Their HID and LED lights are used on the majority of Baja 1000 winners year after year. Their light bars use copper backing to wick away LED heat and a U-swap system so drivers can customize optics to suit driving conditions. 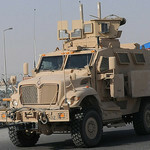 Their lights are also used in military, industrial and agricultural markets. KC HiLiTES has been offering high-performance lighting for off-road vehicles since 1974 and are one of the better known brands for halogen, HID and LED lighting. Lazer Star Lights is a division of Weekend Concepts, Inc. They have made LED light bars since 1992 for automotive and power sports enthusiasts. For more than 50 years, Federal Signal has been in the business of offering comprehensive lighting and alert solutions for emergency and work vehicles. Two of their most innovative technology solutions are in reflector design and an 85 percent reduction in connection failure points in light bars. Read our popular Federal Signal LED Light review! 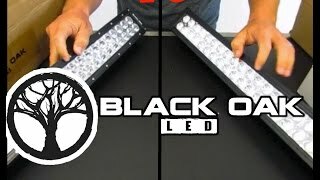 This dual-row 10 inch LED light bar from Black Oak LED is the most energetic, assertive illumination you can buy anywhere. The build quality matches or exceeds that from any other manufacturer on the planet. If you want the brightest, toughest LED light bar that is budget-friendly, this is it. Black Oak is making an enormous impact in the LED light bar market with lights built to the highest standards with competition-busting pricing. This 10-inch D-Series light bar features the finest circuitry, highest-efficiency optics, brightest and longest-lasting LEDs plus a torture-proof housing. These lights are crazy bright and designed to stay that way for the life of your vehicle. 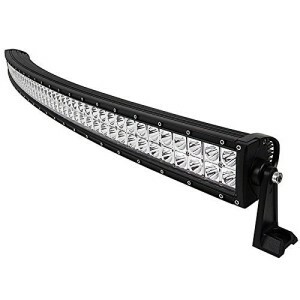 This light bar also comes as a 10-inch curved light bar and a 10-inch linear marine light bar. Black Oak is the new LED light bar market leader with top-quality builds, super-bright, long-lasting LEDs and hugely competitive pricing. The Black Oak LED 10-inch light bar fits all vehicle types in dozens of applications. It absolutely provides the highest value in LED illumination and durability bar none. This pair of Rigid Dually Floodlights feature patented hybrid optics, an unbreakable polycarbonate lens and Rigid’s well-known rugged housing and coatings. These will outshine your normal headlights with a broad beam. They come with Rigid’s 3-year warranty and an expected lifespan of 50,000 hours plus. 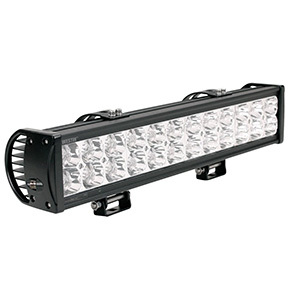 This single, 8-LED 6″ light bar features a 15 degree, medium range beam suitable for on or off-road driving. A pair of these draws 4 amps and puts out 100 lumens more than a 35 W HID lamp. You can order the housing in black, chrome or white. At 3″ tall, it mounts in spaces that other lights of comparable luminosity cannot. This 10-inch light bar is powerful enough to stand by itself on the hood, bumper or grill of your vehicle. It features a rugged enclosure rated at IP67. With the option of either white or amber LEDs, this light bar is an excellent choice for mid-range illumination of the road ahead. This Australian LED light is a premium light for trucks, off-road vehicles and heavy equipment. It features 40 US-Made 3-W Cree LEDS arranged in two rows. Low current draw is achieved with high-efficiency LED drivers and 97 percent input power to the LEDs. The heat sinks are double-sized to ensure the LEDs exceed their expected 50,000 hours of operation. 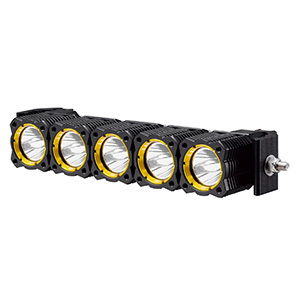 This bar comes in spot, flood or combo configurations with a single row of 12 10-watt Cree SM-L LEDs. It is encased in an aluminum housing with a polycarbonate lens. Each bar has dual power inputs that allow daisy-chaining multiple light bars. Rigid’s single row product line consists of 3-watt Cree LEDs in a low-profile extruded aluminum case. It includes their patented hybrid optics that utilize computer designed reflectors and front lenses that shape the combo beam. It draws under 9 amps and just under 120 watts to produce 2200 lux at 10 meters. Eyourlife makes LED light bars for the budget buyer. 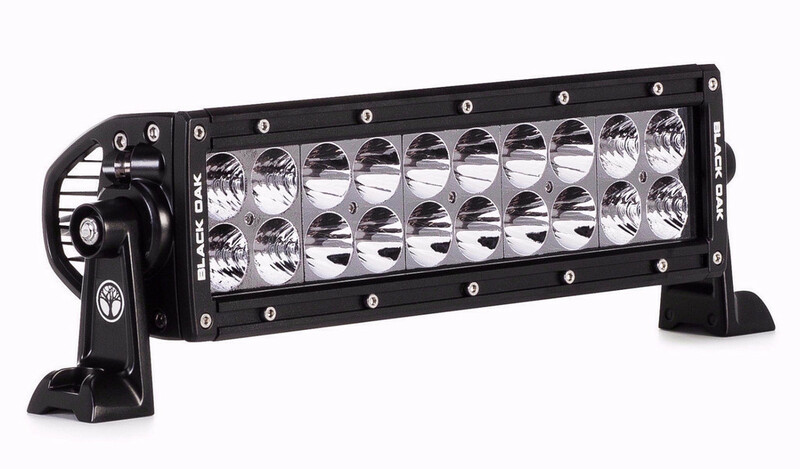 Their 36″ combo light bar features a quartz lens with high light transmission. They use a channel mount, which allows positioning the mounting brackets anywhere along the length of the bar. These clamp to the bar with two bolts each. Like their other lights, these feature a cool white 6000K temperature and an IP68 intrusion rating. The Vision X Xtreme LED puts out almost 100 raw lumens per inch from 5-watt Cree LEDs. The build quality is excellent, rugged, dustproof and waterproof. Their Prime Drive integrated electronic thermal management, a PWM system, provides tight current management and long LED life. 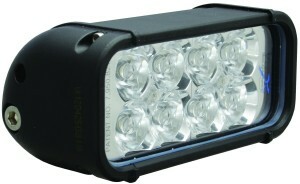 The PX7240 is the 40-degree flood version, whereas the PX7210 is a 10-degree spot light bar. With 26,000 effective lumens from 30 Cree XM-L2 LEDs, there is nothing in the darkness out of its reach. A racer at 100 MPH will not outrun the spotlight. It is one of a few light bars with an impressive IP69K rating. It features Baja Design’s uService® replaceable lenses and optics, CopperDrive thermal management and a 5000K natural daylight color. Obviously, LED light bars are not created equally. Their differences include available options, brightness, light color, beam width, heat management and mounting technology, just to name a few. To reduce potential confusion, start with determining your specific light bar needs. Most 20″ LED light bars provide more than enough light for good or inclement weather when driving on paved roads. Consider starting with a couple of low-mounted 4″ or 6″ flood light bars, which will dramatically increase road visibility. If you do a lot of off-road night driving, then larger light bars, up to 50 inches, are useful. On most cars, your mounting options are somewhat limited, so low-profile light bars make sense especially for grill mounting. 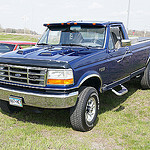 Trucks can mount light bars on the roof, rack, hood or grill, so size and profile are less important. 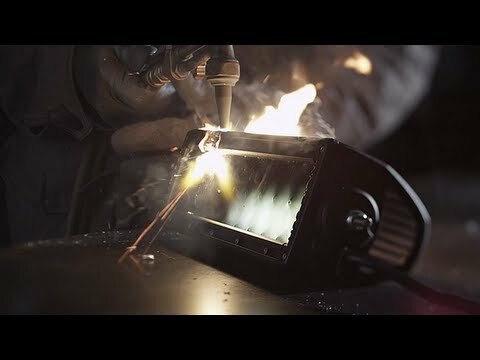 How to Wire LED Light Bars? First, disconnect your vehicle’s or equipment’s battery. Remove the negative/ground clamp first to avoid shorting to the vehicle’s chassis. Use automotive grade wire designated as GPT, GXL or TXL. GPT is the most common. Use the correct wire gauge. Too large a gauge wastes money but an AWG too small risks overheating the wire, which might lead to a panic-inducing fire. Google a gauge-to-amperes table, which includes how many feet you can run before you need a thicker wire. For big draw light bars, you need large gauge wires, e.g., 6 or 8 AWG. To avoid long runs of thick cable, use a relay between battery and switch. Then you can run lighter gauge to the relay and heavier wires from there to the light. Keep wire lengths short as possible and utilize standard wire colors: black for negative, red for positive and yellow from a relay to a switch. It is true that you could buy 2 or more less expensive light bars for the price of a quality one. However, do you really want to risk light bar failure when you need it the most? Reliability and performance come at a cost. Where Can I Buy an LED Light Bar? There is probably no better way to make a personal assessment of LED light bars than to get your hands on several of them and judge for yourself their build quality and performance attributes. Do this by visiting local shops that carry the brands in which you are interested. Most shops have cutaway demo models so you can examine the insides, especially the heat sink and current limiting technology. Before you buy a light bar at your local shop, however, be sure to check the manufacturer’s web site or online outlets such as Amazon or large automotive accessory distributors. These often have specials or large discounts that local shops cannot meet. Should I Use a Relay with My LED Light Bar? If your LED light bar came with a wiring harness that includes a relay, then the simple answer is “Yes.” Otherwise, it depends. The purpose of the relay is to reduce the current load on the switch. If the switch’s current rating is more than the current draw of the light bar, then directly wiring to the switch is fine. However, give yourself some leeway by using a switch whose amp rating is 50 percent higher than that of the LED light bar. See our LED wiring guide, to see some in depth info regarding wiring. Can I Run My Light Bar at a Higher Voltage to Make Them Brighter? First, never apply AC voltage or exceed the DC voltage range specified for your light bar. LED light bars are designed to operate within a specific DC voltage range. They limit the amperage draw to a narrow current range in order to manage the heat and life of each LED. So, a higher voltage should not brighten your light bar. If it does, then probably the LED drivers are of poor design. My Newly Installed Light Bar Does Not Light Up. What Should I Do? Failure for a new light to turn on is usually caused by one of four things: a bad switch, a bad relay, wire that is too small or a bad ground connection. If you can connect the light bar directly to the car battery and it lights up, then the failure is due to one of those four conditions. You may also check out our LED light bar installation guide, to make everything nice and easy. Hopefully, this guide has answered all or most of your questions about how LED light bars work, what kinds of features to look for and how to judge which model is best for your application. The LED light bar reviews here are good examples of the variety of products you can expect to find. The good news is that if you are shopping for an LED light bar that there are plenty of manufacturers, styles and capabilities to suit any need. The bad news is that too much choice can lead to decision paralysis. If you are new to LED light bars and cannot take advantage of the advice of friends who already have them, then the best route is to start with smaller, less expensive light bars to get a feel for their capabilities. Also, study LED light bar reviews carefully. Finding manufacturers who offer 30-day hassle-free returns will minimize your risk. More confident consumers, with this guide and some additional personal research, will be able to find the qualities and capabilities that fit within their budget more easily on the first try. Whichever type of consumer you are, do your research and take advantage of the many online reviews available to make an informed decision.